Cook and drain spinach as directed on package; squeeze out as much liquid as possible. Set aside. In large bowl, mix 1 cup of the cheese blend and the Alfredo sauce. In slow cooker, spread one-fourth of the sauce mixture. 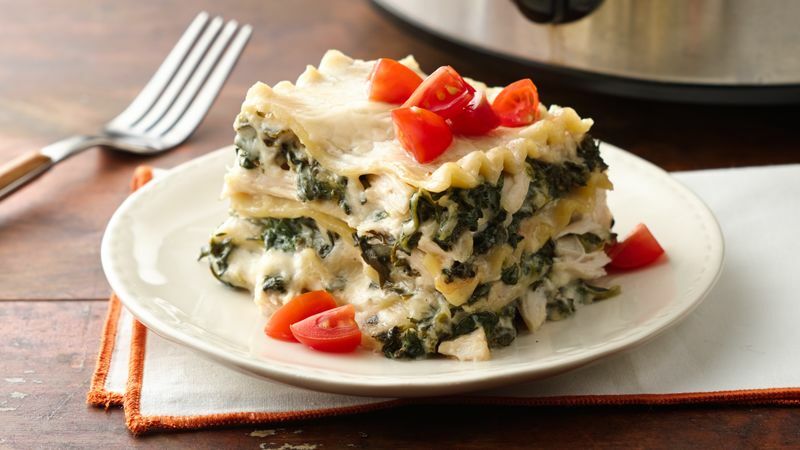 Layer with 3 of the uncooked noodles (breaking noodles as needed to fit), one-third of the chicken, one-third of the spinach and 1/2 cup of the cheese blend. Repeat layers twice. Top with remaining noodles, sauce mixture and the Parmesan cheese. Cover; cook on Low heat setting 3 1/2 to 4 1/2 hours or until edges are bubbly and center is heated through. Let stand 10 minutes; sprinkle with diced tomato before serving. This recipe uses 2 boxes of frozen spinach, but if you’d prefer less, you can use just one box. Cooked and drained frozen chopped broccoli makes a nice substitute for the frozen spinach.